Nana-chan ningyou ("Nana-chan doll") is a huge female mannequin in front of Nagoya's Meitetsu Department Store. Since 1973, she's towered over shoppers in a variety of seasonal and promotional outfits. 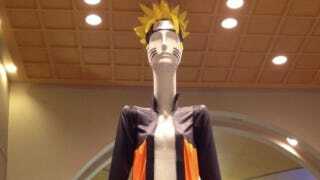 Recently, Nana-chan donned Naruto gear as part of a campaign for the new Naruto animated film, Road to Ninja: Naruto the Movie, giving Nagoya the opportunity to see what Naruto would look like elongated and with breasts. Finally!